** The Palm Coaster, Spring 1984, pp. 6 & 7. ...What Community do you live in....? 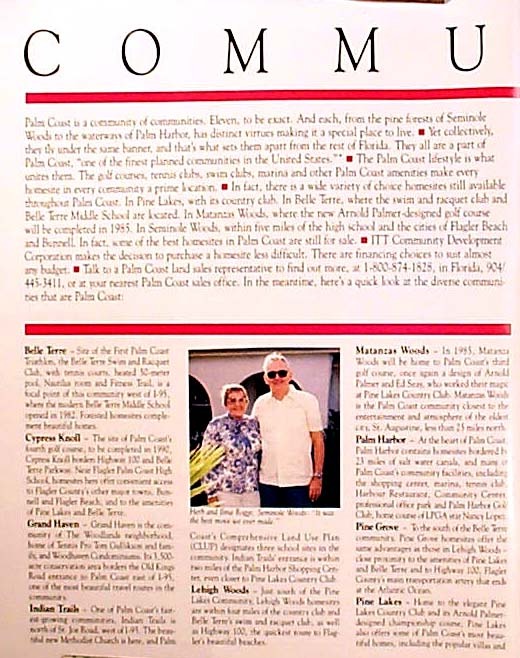 Belle Terre -Site of the First Palm Coast Triathlon, the Belle Terre Swim and Racquet Club, with tennis courts, heated 50 meter pool, Nautilus room and Fitness Trail, is a focal pint of this community west of I 95, where the modern Belle Terre Middle School opened in 1982. Forested homesites compliment beautiful homes. Cypress Knoll - The site of Palm Coast's fourth golf course, to be completed in 1990, Cypress Knoll borders Highway 100 and Belle Terre Parkway. Near Flagler Palm Coast High School, homesites here offer convenient access to Flagler County's other major towns, Bunnell and Flagler Beach, and to the amenities of Pine Lakes and Belle Terre. Grand haven - Grand Haven is the community of The Woodlands neighborhood, home of Tennis Pro Tom Gullikson and family, and Woodhaven Condominiums. Its 3,500 acre conservation area borders the Old Kings Road entrance to Palm Coast east of I 95, one of the most beautiful travel routes in the community. Indian Trails.- One of Palm Coast's fastest growing communities, Indian Trails is north of St. Joe Road, west of I 95. The beautiful new Methodist Church is here, and Palm Coast's Comprehensive Land Use Plan (CLUP) designates three school sites in the community. Indian Trails' entrance is within two miles of the Palm Harbor Shopping Center, even closer to Pine Lakes Couontry Club. Lehigh Woods - Just south of the Pine Lakes Community, Lehigh Woods homesites are within four miles of the country club and Belle Terr's swim and racquet club, as well as Highway 100. the quickest route to Flagler's beautiful beaches. Matanzas Woods - In 1985, Matanzas Woods will be home to Palm Coast's third golf course, once again a design of Arnold Palmer and Ed Seay, who worked their majic at Pine Lakes Country Club. Matazas Woods is the Palm Coast community closet to the entertainment and atmosphere of the oldest city, St. Augustine, less than 25 miles north. 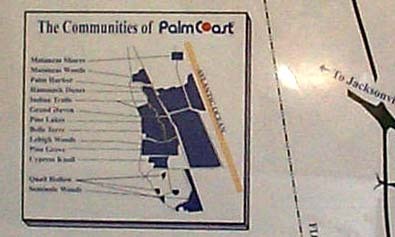 PALM HARBOR - At the heart of Palm Coast, Palm Harbor, contains homesites bordered by 23 miles of salt water canals, and many of Palm Coast's community facilities including the shopping center, Marina, Tennis Club, Harbour Restaurant, Community Center, professional office park and Palm Harbor Club, home course of LPGA star Nancy Lopez. Pine Grove - To the south of the Belle Terre community. Pine Grove homesites offer the same advantages as those in Lehigh Woods - close proximity to the amenities of Pine Lakes and Belle Terre and to Highway 100, Flagler County's main transportation artery that ends at the Atlantic Ocean. Pine Lakes - Home to the elegant Pine Lakes Country Club and its Arnold Palmer designed championship course, Pine Lakes also offers some of Palm Coast's most beautiful homes, including the popular villas and new models coming in 1984. Quail Hollow - Site of the new Flagler County Council on Aging headquarters, Quail Hollow is a beautiful community south of Highway 100, where less that two miles east are the Flagler County Airport and Flagler Palm Coast High School. Bordering U.S. 1, Quail Hollow offers homesites that make quick trips to Daytona Beach even quicker. Seminole Woods - Also south of Highway 100 and due east of Quail Hollow, Seminole Woods is the Palm Coast community whose entrance is within four miles of the Arlantic Ocean. The wooded homesites here, as in Quail Hollow, are close to Daytona beach, yet less than ten miles from the attractions of the communiity there are a part of - Palm Coast. 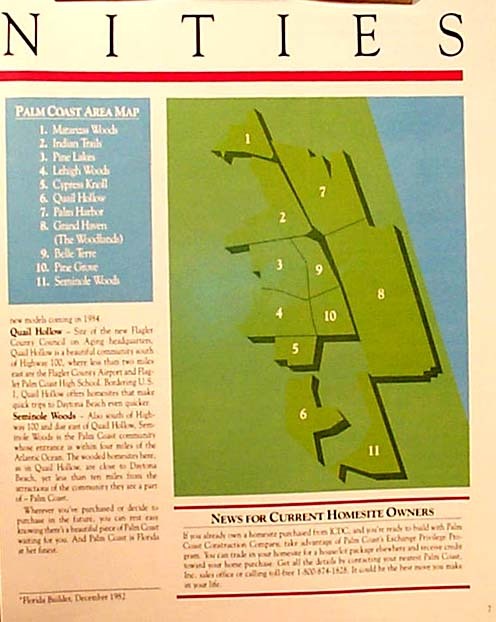 Wherever you've purchased or decide to purchase in the future, you can rest easy knowing there's a beautiful piece of Palm Coast waiting for you. And Palm Coast is Florida at her finest. If ou already own a homesite purchased from ICDC, and you're ready to build with Palm Coast Construction Company, take advantage of Palm Coast's Exchange Prilileg Program. You can trade in your homesite for a house/lot package elsewhere and receive credit toward your home purchase. Get all the details by contacting your nearest Palm Coast Inc. sales office or calling toll-free 1.800.874.1828. It could be the best move you make in your life. We will continue to remain Stewards of these Historic Resourses, awaiting a Museum.